Today I’d like to share with you one tip – how to make a sweater that’s too big fit just right. I’m probably the only person I know who can’t wear oversized clothes, because… they don’t fit me! I don’t know why, actually. Maybe they don’t suite my figure; maybe they just don’t look right; maybe they just don’t feel right. Anyway, with today’s fashion it’s hard to find well-fitting clothing (not to mention that mass production cannot fit everyone), but with basic sewing knowledge it’s quite easy to adjust clothing to your figure. Today I’ll show you how I fitted a sweater that I found in a thrift store a while ago. It was a bit oversized, but the fabric was lovely, so I bought it. Unfortunately, the more I wore it, the more oversized and ill-fitting it looked. Then one day I decided to make it fit. I must warn you – this is not the easiest way to fit a sweater and it might be challenging (it depends on how stretchy the fabric is). The easiest way (and the most common way you’ll find on the internet) is to take a sweater, turn it inside out, sew along red lines and cut the unnecessary fabric (see the picture below). 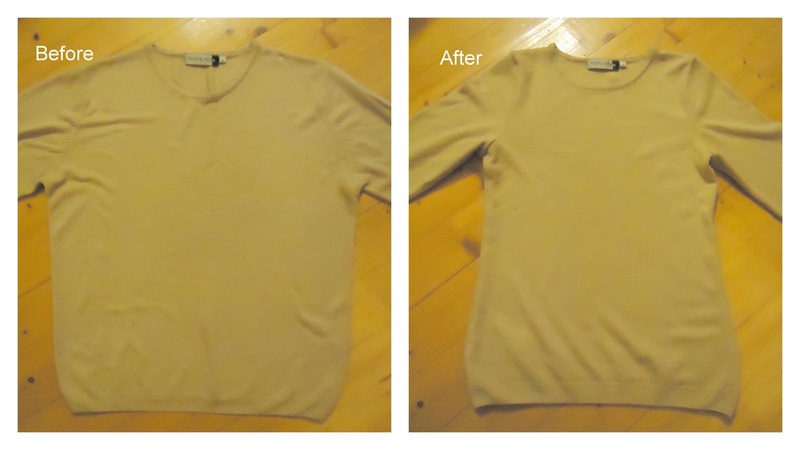 However, I don’t use this method – it creates wrinkles near armpits and if the sweater (or t-shirt) is really oversized, it will have wide shoulders and using this method will not make that go away. Attention: this method will take away a couple of centimeters from the length of sleeves, so if your sweater sleeves are just the right length now, you should have in mind that they will be shorter. Step 1: remove the sleeves (carefully, so it doesn't stretch out). Don’t cut anything else. Step 2: fold sleeve pattern piece in half, put it on the removed sleeve and mark. If it’s hard to mark sweater with chalk (I know it was impossible to mark mine), try stitch with a different colour thread (you will later take it away). Mark both sides of the sleeve. Sew the length of the sleeve with a stretchy seam and zig-zag sides. Cut the excess fabric. Step 3: take the bodice, put the bodice pattern on it (shoulders must match), mark and sew the sides, cut the unnecessary fabric. Step 4: simply add the sleeves and sew. Iron the new seams (if the fabric is iron-friendly) and you’re done!